Just like life itself, macro photography teaches me that the deeper you look, the more you see. This month's Calvert Photography Club meeting included a presentation by Robert Tinari on close-up and macro photography. Although I've been dabbling in macro photography off and on for a few years, I learned some things and Robert presented some great images during his slideshow. Being inspired when you walk out of a room is a great feeling. Not only was the presentation topic "macro", but our monthly assignment is macro as well. The monthly "assignment" serves a couple purposes. First, we try to coordinate it with a new topic or technique that people may have just learned about (hence, the presentation on macro and an assignment on macro). It provides beginners an opportunity to try something new and a forum to share the results. 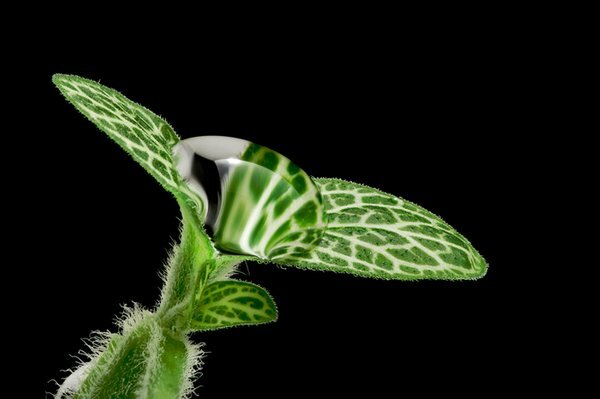 For those already familiar with a technique like macro, it may provide an opportunity to expand on your knowledge or concentrate on a particular specialty technique. In my case, the technique I've been wanting to play more with is focus stacking so the macro assignment worked out perfectly. I spent most of the weekend with my Sigma 105mm on the camera at all times. And when Sunday turned out to be a 24 hr rain fest, well, that was the perfect excuse to setup my softbox and see what the world has to offer up close and personal. In this image above, I once again used Helicon Remote to capture the individual images. I've blogged before about the first image I captured using the software, and it really is proving to work out quite well. This images was created using 11 focus stacked shots. Each shot was taken a f/9, ISO 100, 4 second exposure. The water droplet is about 4mm across to give you an idea of scale. The resulting image was a little dark and color a little flat (the individual shots were too). To fix that I processed using basic controls in Lightroom, then cleaned up some focus stacking artifacts from hot pixels (I went over it with a fine-toothed comb). Final step was to sharpen the output (sharpening should always be your final step). The final image is ~4500x3000 pixels, easily clear enough for a large print. I'm going to continue to play with the focus stacking technique. I think this month's assignment will definitely push me to learn something new and bring my macro photography up a notch.